Save time and money by passing code inspections the first time! 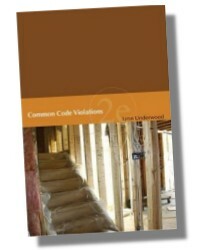 Common Code Problems 2nd Edition, is an up-to-date guide that examines the significant safety code compliance elements for one- and two- family dwellings. 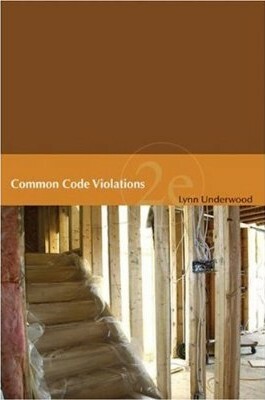 From plumbing, mechanical and building guidelines to fuel gas and electrical installations, this book includes the critical code criteria, all based on the 2009 International Residential Code. 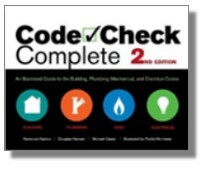 With comprehensive coverage and a unique emphasis on the most essential inspection items, it is an ideal resource for building superintendents, city building safety offices, architects, and anyone seeking a guide to code inspections. 2. Site Utility Installation Inspection. 7. Wood Frame Shear Wall Inspection. 8. Rough Plumbing Installation Inspection. 9. Rough Mechanical Installation Inspection. 10. Rough Electrical Installation Inspection. 11. Final Frame Inspection (Pre-concealment). 12. Pre-insulation Inspection (Pre-concealment Pickup). 13. Insulation Installation and Energy Inspection. 14. Exterior Siding and Veneer Installation Inspection. 17. Site Work and Landscape Installation Inspection. Lynn Underwood, C.B.O. received Bachelor’s degrees in both Journalism and Engineering Technology from New Mexico State University. Lynn is currently a code official.